Two years back on our trip across europe ,travelling with my crazy, quirky set of friends we chanced upon a small seaside restaurant while searching for a club in Naples.We started out from Pompei to experience the “Night Life” of Naples and travelled 20 kms away from the city in search of the phantom all night open club.What we found instead was a lazy seaside restaurant where the only sound you could hear was of the waves crashing wildly against the rocks. We also heard later that we were better off at the restaurant than the actual “Nightlife” of Naples. Rumours say the nightlife of Naples is the not so discreet Mafia activities at the harbour!Our host at the airbnb spent very difficult 25 minutes explaining to us in italian how we should hold our bags and run like hell if anybody approaches us. The restaurant was an ethereal experience.To be in a beautiful place in an never experienced part of the world with your closest friends who have taken the trouble to travel from different parts of the world to spend time together and share a meal is magical.What did throw us off kilter was that the owner who was also taking the orders didn’t understand a word of english so we resorted to using hand gestures and ordered food by pointing out random dishes on the menu. I wish I had taken pictures of the food we had ordered because each dish(except for the veg pasta) that we a new experience.We had most of the famous italian seafood was on our table. It was the first time I tasted sea urchin and squid heads. One dish which my very protein conscious friends ordered was a grilled fish with veggies. I took inspiration from the fish we ate in that small restaurant to create this dish. It looks pretty but all you need is chuck a few things haphazardly in the aluminium foil with the fish,scrimp the foil together and bake it for 20 minutes.Dinner cannot get simpler than this!This is a very versatile dish.You can make a bigger fish if you are sharing it with people at dinner or buy the smallest fish(as big as my palm) like I did and eat a peaceful dinner watching TV in your own company. This fish is high on protein and is whole 30 and Paleo approved.If you like your food spicy please rub the fish with a mix of black pepper and salt before starting out.You can also cut the chillies into small pieces instead of halving it for more heat.The flavour is a subtle mix of orange,basil and chilli. 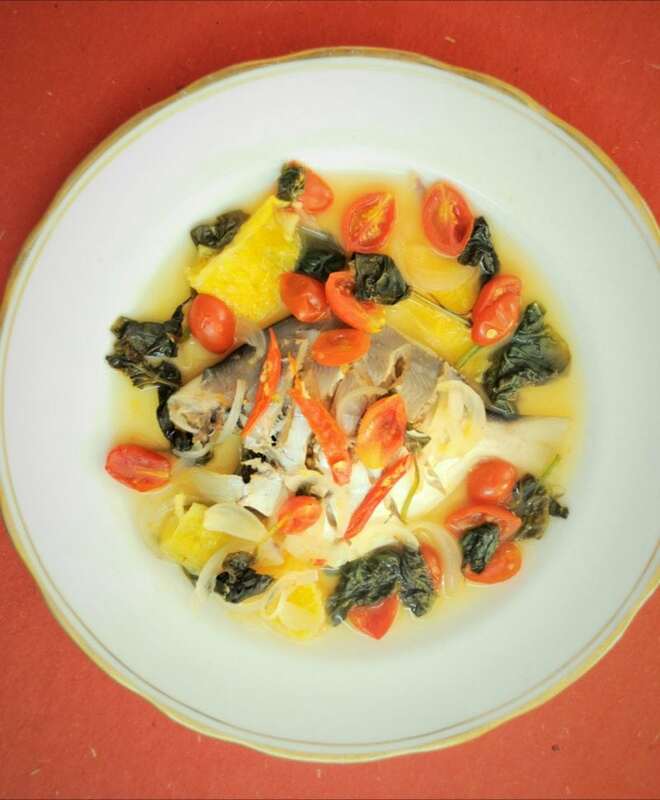 Paleo and Whole 30 approved White Fish in orange sauce with cherry tomatoes,baby spinach and Basil.This is a quick recipe which requires basic cooking skills. Make incisions or cuts on the fish.This makes sure the spices and flavours seep inside it. Salt the fish well.Take enough foil to wrap the fish and vegetables easily. Place the fish and all other ingredients inside the foil.Make a parcel of it. Bake it in the oven at 180 degrees for 20 minutes. if you don't have an oven at home place the parcel in a shallow pan with a lid.Add 3 tablespoon of water to the pan.Cook it at medium flame for 15 minutes. Once cooked remove the fish and place it on the plate. Add 4 tablespoon of water to the rest of the ingredients still in the foil parcel.Cook it in the oven or pan for 5 minutes without the fish. Pour the broth over your fish and enjoy!